Apply starter fertilizer where it belongs, below the seed. Better stands due to improved seed-to-soil contact. 1. Fast Germination: Seed is dropped precisely into the V-slice formed by the insert yielding superior seed-to-soil contact in moist, firm soil. Seed-to-soil contact is essential for fast germination. 2. Uniform and Fast Emergence: This occurs when seeds are planted in moisture but not too deep or at varying depths. The V-slice technology assures that the soil is not disturbed beside or below the seed, with less chance of drying out. In No-Till and Min-Till planting environments, the notched discs mellow the soil above the seed and allow for easier plant emergence right above the seed with less opportunity for crusting which inhibits emergence. 3. Early Root Development: Acra-Plant V-slice inserts and notched retrofit discs create a firm soil environment surrounding the seed to retain moisture and allow for healthy primary root development. Feeder or secondary roots depend on the moisture above the seed as well as healthy primary roots. Tight, uniform seed placement and firm soil right above the seed assist in the retention of moisture for healthy root development. 4. Uniform Plant Spacing in the Row: Acra-Plant V-slice technology forms a “V” that traps the seed and stops seed bounce and roll. 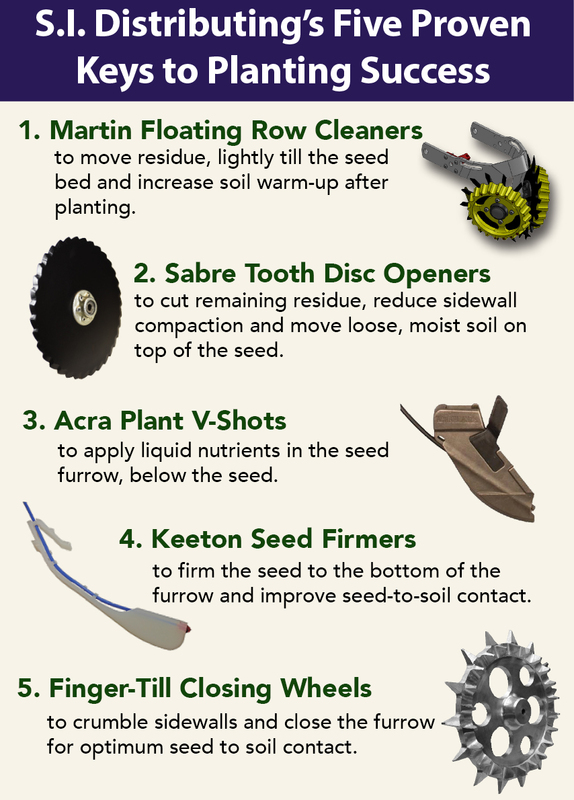 In the Min-Till and No-Till environments, notched discs assure that he soil is prepared to accept the V-slice insert and form the perfect V. Seeds that do not tumble, roll or bunch assure “picket fence” planting for the most uniform stand. 5. Proper Plant Population: Acra-Plant minimizes the need for over-planting due to seed loss, skips and bunches. 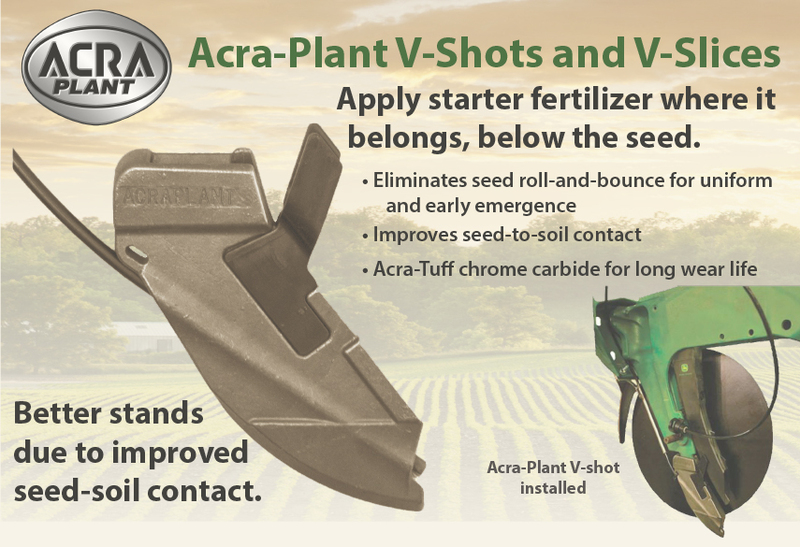 Proper competition for nutrients and availability of sunlight assures the best stand, and the superior performance of Acra-Plant V-slice technology assures the most effective use of planting equipment. 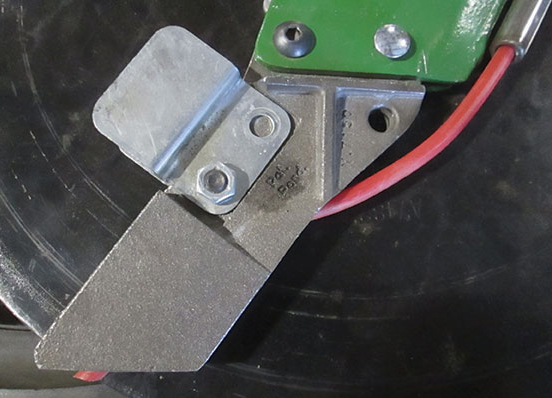 Seeds per acre can usually be reduced with the use of Acra-Plant V-slice inserts and notched discs, reducing seed costs while improving the stand. 6. Correct Leaf Position: Seed kernels caught lengthwise and on the edge in a perfect V-shaped trench germinate with primary roots growing down the row in the angle of the V. Leaves grow perpendicular to the primary root growth, increasing the potential for leaves to grow across the rows for maximum sunlight utilization. Does this sound crazy? Grow some seeds on your windowsill and watch the leaves position themselves with respect to the primary roots. V-98 Opener. Fits Case-IH 800, 900 and 1200 series. V-Shot Insert. Fits Case-IH 1200 series. NOTE: Customer must drill one hole in center body of planter to install. The hole is for the liquid tube. V-Slice Insert. Fits Kinze 2000 series and all John Deere except XP row units. Also fits New Idea 9200. V-Shot Insert. Fits John Deere 7000, 7100 MaxEmerge (built in 1984, 1985 and early 1986). V-Shot Insert. Fits John Deere 7000, 7100 MaxEmerge and Kinze 2000 series planters. V-Shot Insert. Fits John Deere MaxEmerge 2, MaxEmerge Plus and MaxEmerge Pro. Also fits John Deere 1530 and early 1535 drills. V-Shot Insert. Fits John Deere XP, XP Pro and MaxEmerge 5 row units. V-Slice Insert. Fits John Deere XP, XP Pro and MaxEmerge 5 row units. V-Slice Insert. Fits Kinze 3000 series. Includes special socket-head cap screws with Loctite. V-Shot Insert. Fits Kinze 3000 series. V-Slice Insert. Fits White 6000-8000 series. Does not fit White 9000 series. V-Shot Insert. Fits White 6000 and 8000 series. Does NOT fit White 9000 series..
V-Shot Insert. Fits White 9000 series. V-Shot Insert. Fits the Kinze 4900 row units only. Tube extension bracket. Required when a straight, instead of curved seed tube is used. V-51 Opener. Fits White 5100 and 5700 series.